That's a pretty great cast line up the-wait, does Kate Mulgrew have an eyepatch? And is that a Robot!? I should watch this show. But yes, Karen Gillan will be joining the cast for the third season of the rather fantastically named National Terrorism Strike Force: San Diego: Sport Utility Vehicle, which starts airing on Adult Swim this July. The ex-companion plays Daisy, the Tech Expert for Paul Scheer's counter-terrorist group, in a season that promises "extreme lengths including surgically swapping faces with each other, kidnapping an alien, faking their own deaths and, er, entering the dangerous British District of San Diego. ", according to the Radio Times. 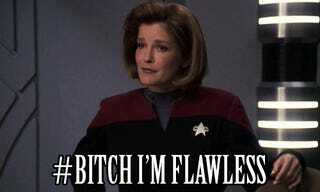 Amy swapping faces with Janeway? I'd watch that.